i thought i'd post up some pics of my 84 charcoal/red orange ls interior, these ones are manual. Last edited by yoshirocks702; 03-26-2009 at 09:38 PM. thanks for the research. all this interior is unbelievable. Thanks for posting up Yosi! Your interior looks great. And now we finally have a picture of what an 82 interior looks like other than out of a brouchure. 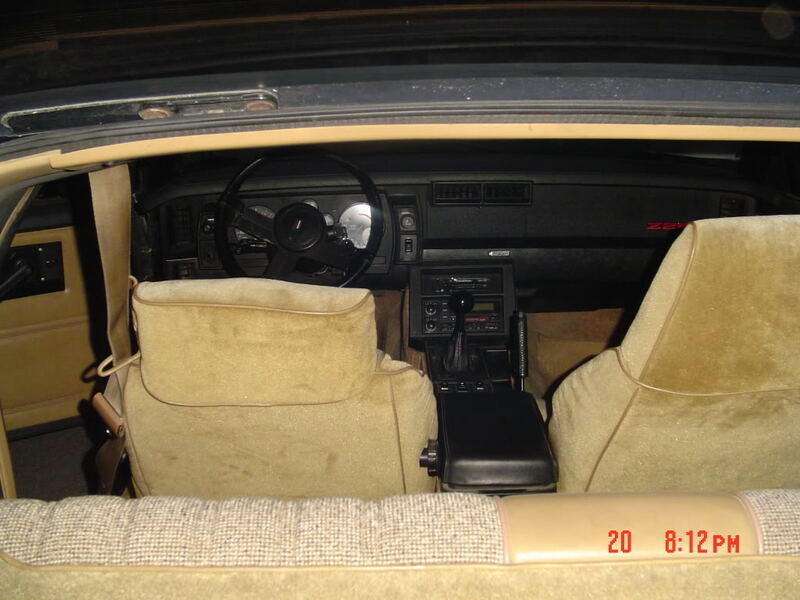 In the picture of the 82 interior it shows two different head rests. Is that normal? Looks like one of those seats was added later. it's possible, i don't know much about the history of that car. I know the guages are all SAE except the speedo which is in metric. I also know that that car was pretty loaded it had cruise, ac, t-tops, power mirrors, power windows, power hatch, and power locks, it looks like it has the basic am/fm cassette player as well. I've never seen another Conteur interior where the headrests didn't match, even though the passenger side wasn't a L/S seat. Actually, I believe the passenger seat probably were L/S, just not fwith the funtioning conteur. This link was given to me by James C. He found it on Craigslist. 60 dollars a yard for the burnt orange camaro spectrum cloth for 83/4. The guy has 40 yards worth!! I will copy his name and number and keep it but i wont directly post it on here since there is no telling if he would want that or not. this is a fantastic interior, does anyone know how hard it would be to do this interior, seats and door panels? would i have to look for original seats somewhere or does someone make them still? i really want this interior in my car. Its not that hard. I did it. If you want to do it right you gotta find the seats and get them redone. No one reproduces the seats or the fabric (one of the places i listed in the first post of this thread may reproduce the fabric but i have no confirmation on this yet) so once its gone..its gone. 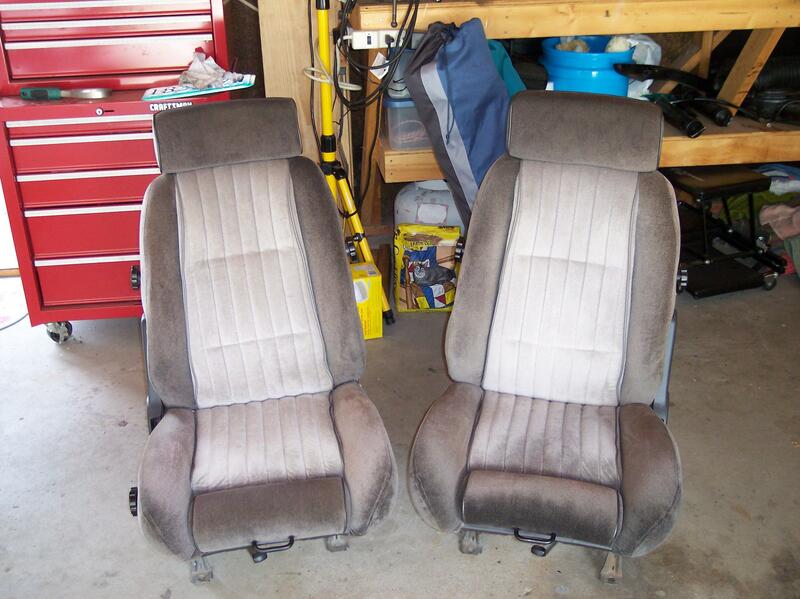 If you look back through the posts in this thread i posted a link to someone on this board trying to sell a set of the front seats. There is nothing different about the back seats other than the fabric. Door panels can be redone as well. Just read through this thread. I think everything you need should be here. If not pm me and I'll see if i can point you in the right direction. Last edited by subroc; 03-31-2009 at 02:06 PM. i really appreciate the help, and advice. Man I am glad someone else had done the research on the Camaro side besides me. I have researched these seats and all of the various GM cars they ended up in, and I can add to the applications where they can be found. As stated by Genesis98 above, they were standard in the 1982 Buick Grand National, and then again in 1984 they were standard in the GN with them being an option in the T-type Regals. Both years they had sand grey colored cloth bolsters with dk. grey leather inserts and headrests. 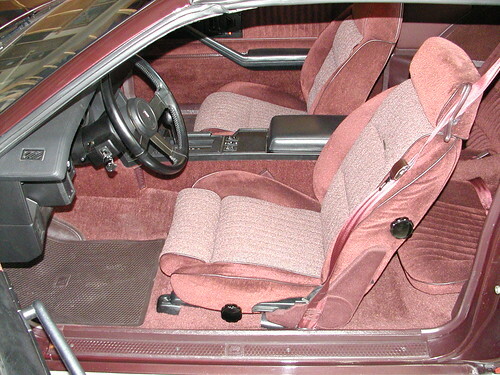 The 82 headrests were a little different in design than those in the Camaro or the 1984 version of the GN/T-type ones. The ones from the GN will bolt into an F-body by just changing the seat slides. 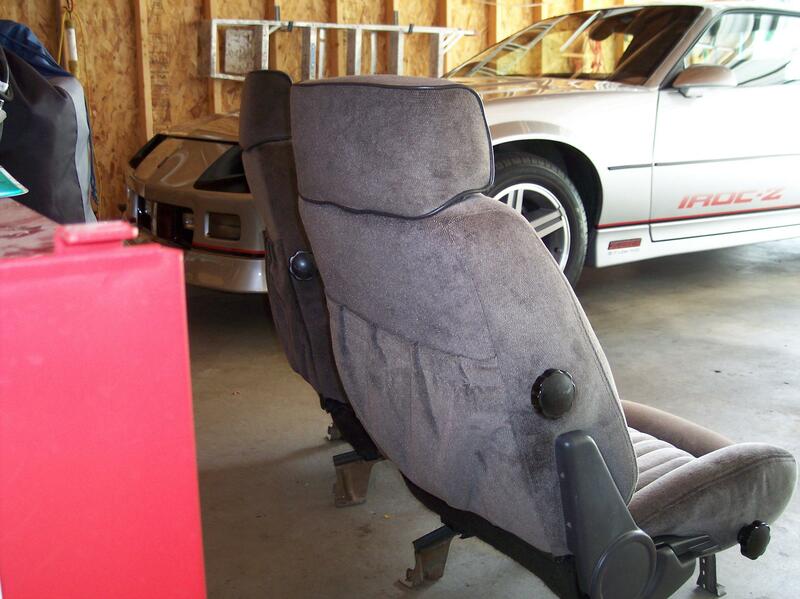 I have attached some pictures of the 82 & 84 GN seats for reference, and I have also attached ones used in the Trans Am models that were on Ebay for sale about a month ago by a guy in Vacaville CA, they went cheap for $250.00 for the pair. I worked with the guys at PUI to make covers for the 84 GN & T-type seats, and the pattern is almost the same as the ones for the 82 seats in a Camaro. 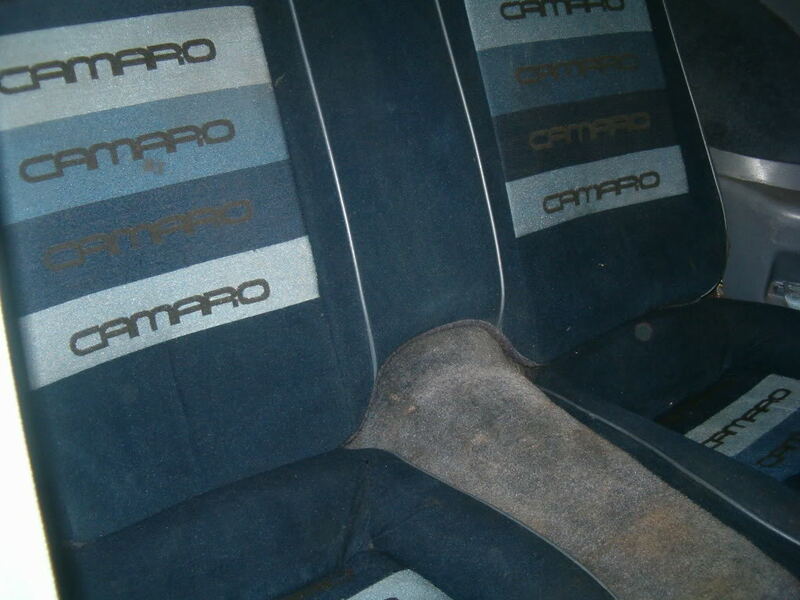 Actually in 1982 there were not any Camaros with functioning headrests on the passenger seat except the Pace Cars. That is why the car with the L/S driver's seat has the regular production custom interior seat with the matching covers of the L/S seat. 1983 & 1984 models: did not require Custom Interior option to order the L/S seat. 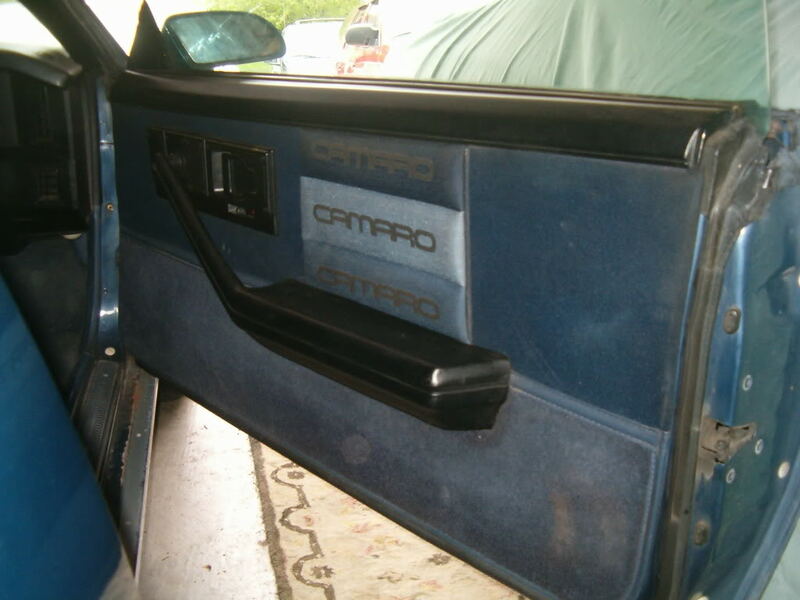 When the Custom Interior was not ordered the car did not get the Spectra cloth door panels, instead the car received the standard vinyl door panels. The option was $375.00 when ordered with the standard vinyl Z-28 interior, and was $650.00 when combined with the Custom Cloth interior. ***Of special note there were 10 special odered Z-28's used for the Miss USA pageant in Knoxville TN for 1983. All were white base Z-28's optioned with the base LG4 engine, automatic trans, a/c, tilt, delay wipers, am-fm cassette, t-tops, and the L/S interior in brown with the standard vinyl door panels. They all had an engraved plaque on the dash denoting the use of the vehicle and the date of the pageant of May 21, 1983 along with the pageant logo. Only one is known to exist as late as 2007, however its whereabouts are unknown after the garage it was stored in was torn down for new construction. This car also had its original engine replaced by 1991 with a 327. 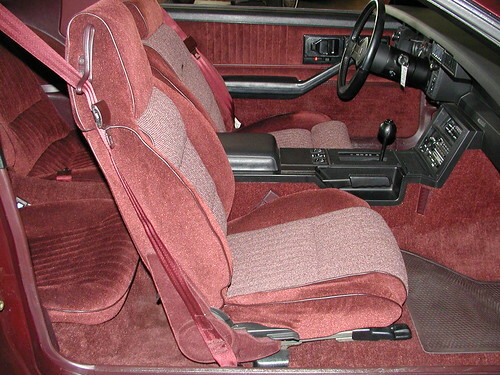 1985 models: the Custom Interior option was required to order the L/S seat, and the cost was $650.00. 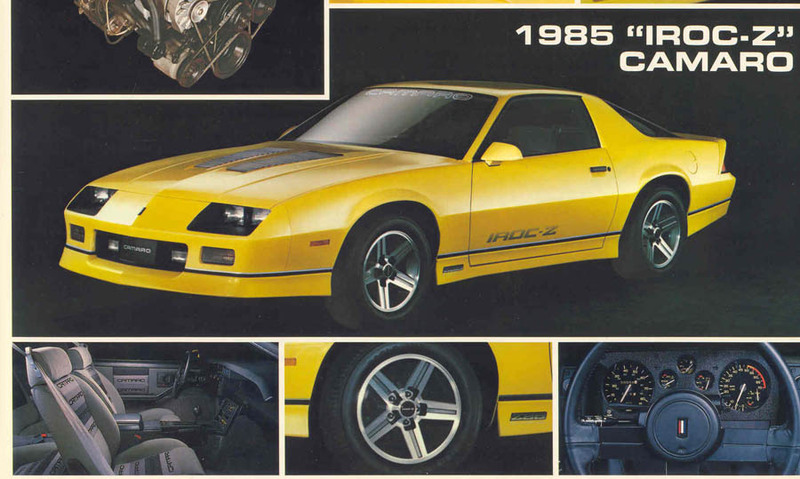 The single page handout of the 1985 IROC shows a yellow car with the L/S interior option. However, instead of the normal production accent color of black cloth this car has the regular production grey cloth with the three color "Camaro" panels. Thats the saddle interior for 85. Thanks for adding to the research. Very informative! Hopefully this thread will save some of these interiors for the junkyard. But let me get one thing straight. Are you saying that in 83/4 you could get the LS conteur seats without the spectrum cloth for less? If so thats an interesting bit of knowledge. I would like to see one of those cars for curiousity. But my personal opinion...the spectrum cloth makes the interior. Last edited by subroc; 04-04-2009 at 06:11 AM. subroc[/b];4106807]Thats the saddle interior for 85. The handout I have here shows a grey interior, definitely not the tan one as shown in the factory brochure on page 3. 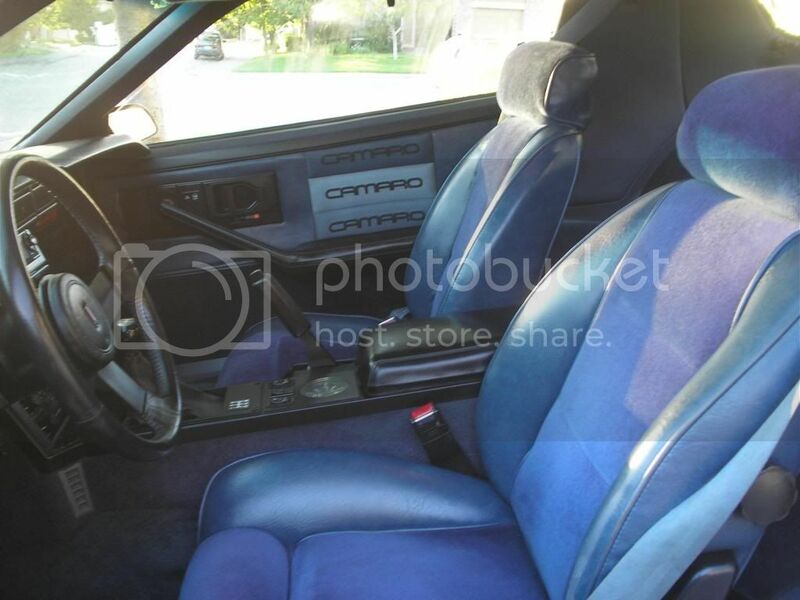 I remember when the dealer got these handouts that they ordered a Bright Blue IROCa car with this interior, and they "assumed" it was the charcoal one listed on the order sheet. The car that came in ended up getting the black/charcoal one as we know now was the only grey version available. The customer that ordered it didn't take the car as he didn't like the black as compared to the grey shown on the handout. Do you have a copy of this handout showing the tan interior? I know that these handouts cannot be used for reference as the 1983 Monte Carlo SS handout has a lot of differences when compared to the actual production car: no SS on headrests, bowtie on the center caps, chrome trim rings instead of brushed, brighter colored graphics, 115mph speedo compared to production 85mph, and a trunk lock bezel that production never used. JamesC: there are Buick GN's in 84 that do not have the shoulder belt guides and the reason is unknown. Are those seat you have from an 84? If so, then it sheds light onto what I have been thinking was possible, Lear Siegler wasn't installing them for some reason whether parts supply issues, or a design change between the 83/84 years to not install them. 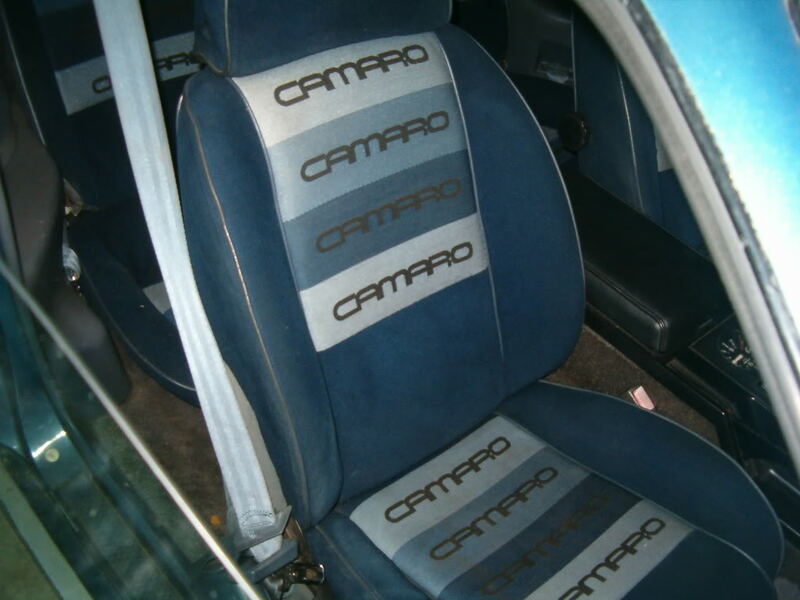 I have not seen any Camaro w/o them, and your seats are a first in any F-body that had these seats. Any other info you can provide would be great! Interesting. Note the following pic, which shows that the seats did not (at that time) have the seat-back fold-down lever. Also note the slides. Last edited by JamesC; 04-05-2009 at 06:43 AM. Also note the gorgeous iroc in the backround. 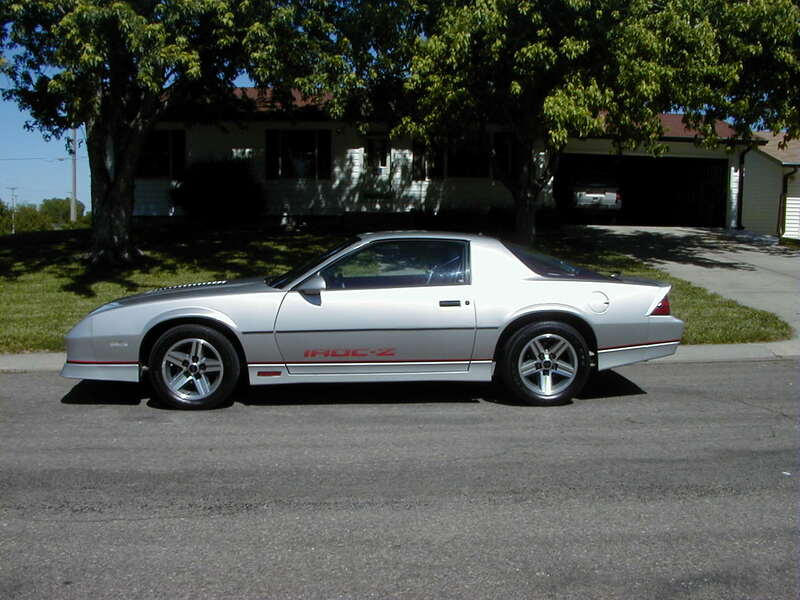 That is def one of my favorite colors on an iroc...silver with red lettering. Yup if you look at the first group of pictures in the first thread i have that picture and made a comment about it. Im thinking they originally planned on doing dual conteurs in the camaro as well as the firebird but maybe decided not to because of budget? 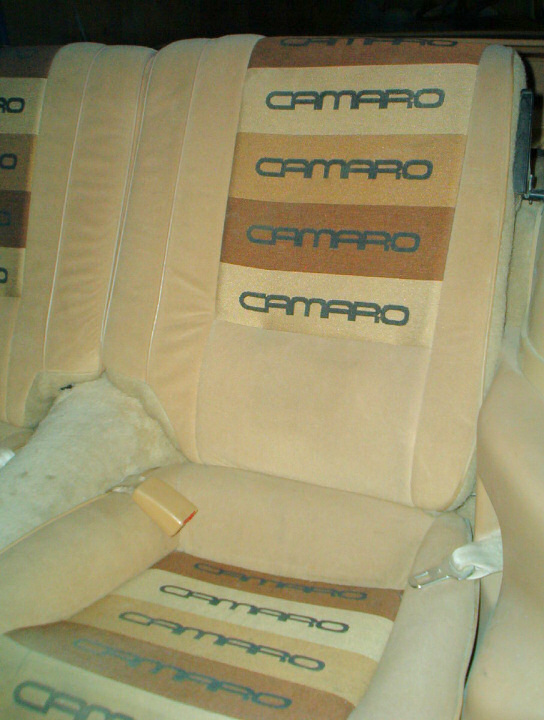 The camaro seats did have that special cloth so maybe that is one reason why they cut the idea. Also James again i love your car. I have only seen two on ebay similar to yours. They were both 85 silver irocs with red lettering and the red LSC interior. Both had lowish miles too. Im kinda kicking myself i didnt nab one. Unfortunately the door panels were all I could salvage when I did the interior. I have since obtained new blue spectrum fabric. Last edited by 70rs/ss; 04-22-2009 at 04:38 PM. 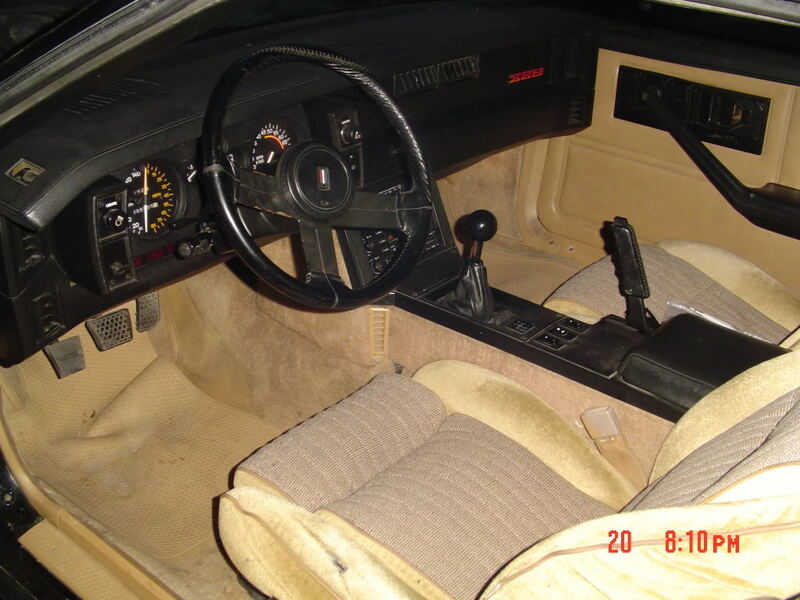 As far as I know there is no real breakdown as to how many camaros got the interior per year. If i find anything different it will def make it into this thread. I forget the exact count of pace cars that year but every one of those got the LS/C interior. So those plus some z28s that year. 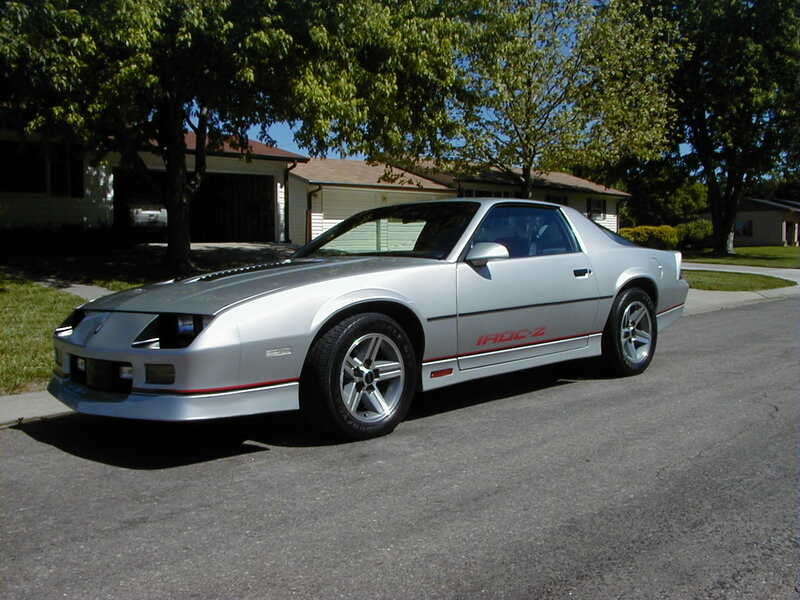 BTW that is one GORGEOUS z28. Is that original or restored? I really love seeing that Claret color. That is a great looking car. I was wondering why the power window and hatch switches looked brand new. 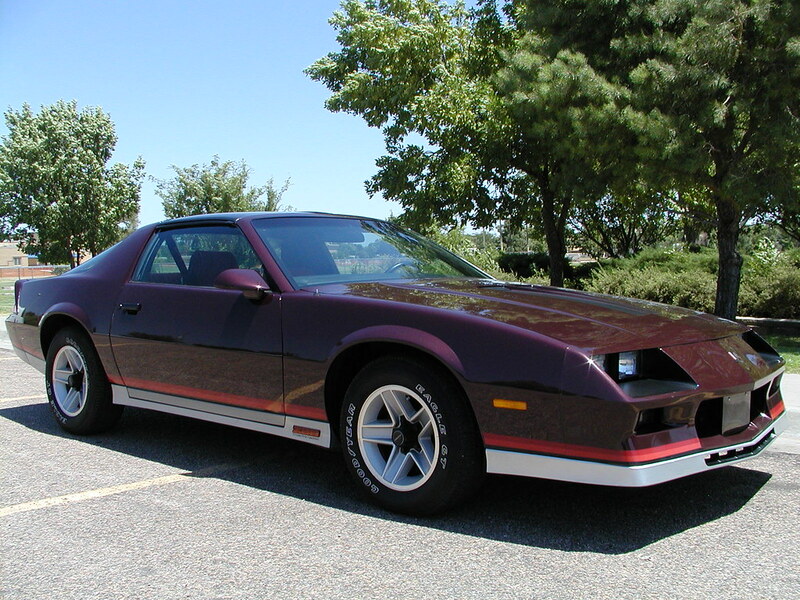 I have an 82 Z28 with a white exterior and the claret interior. is this rare? Or is the interior worth much? 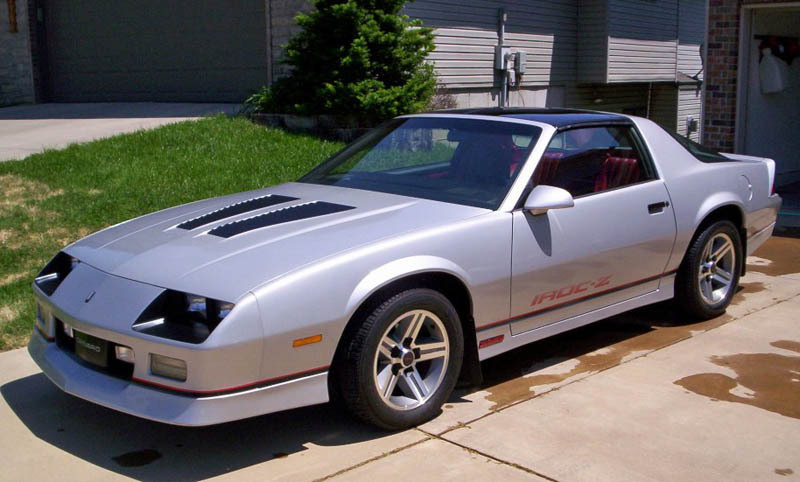 I got a 1984 Z28 with the Camaro spectrum/contour seats. There Blue. I deffinatly knew it was kinda rare, but is it? It is very cool. Ill take pictures on mine. Its getting rare. Im not sure i would say its rare just yet. There were not many of them made and they were all made during the early part of the third gen line so finding ones intact that have not been crushed or messed up over time is difficult. If you read over the first post you will understand why not many were made. It was mainly due to the extra cost...but also probably due to the fact it was either a love it or hate it interior. Yeah I read that i was like WOW $650!! Yeah I always thought ew that interior is nasty. Then I thought it was really neat once I got into the 3rd gens. Then I got mine and love it. 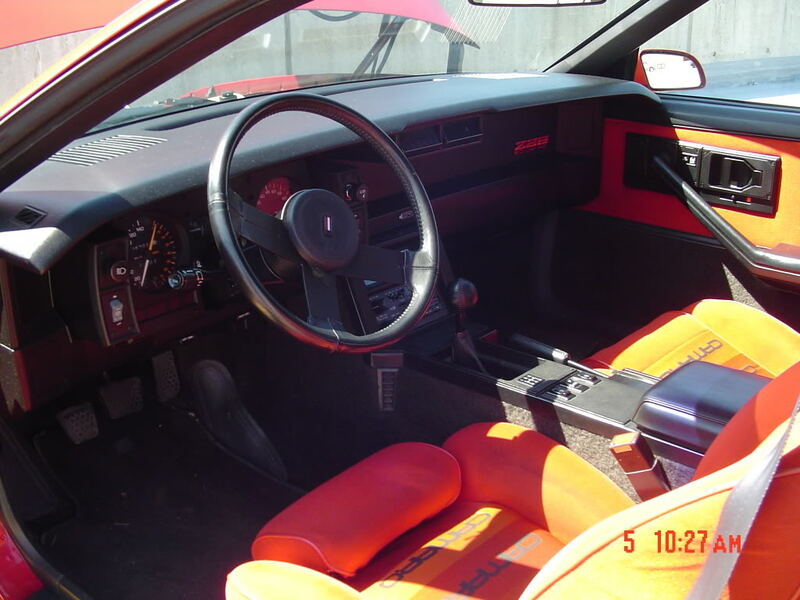 Not to mention the drivers seat is probably one of the most comfortable ever put in the third gen camaros and firebirds (that along with recaros). Yes i love the interior too. 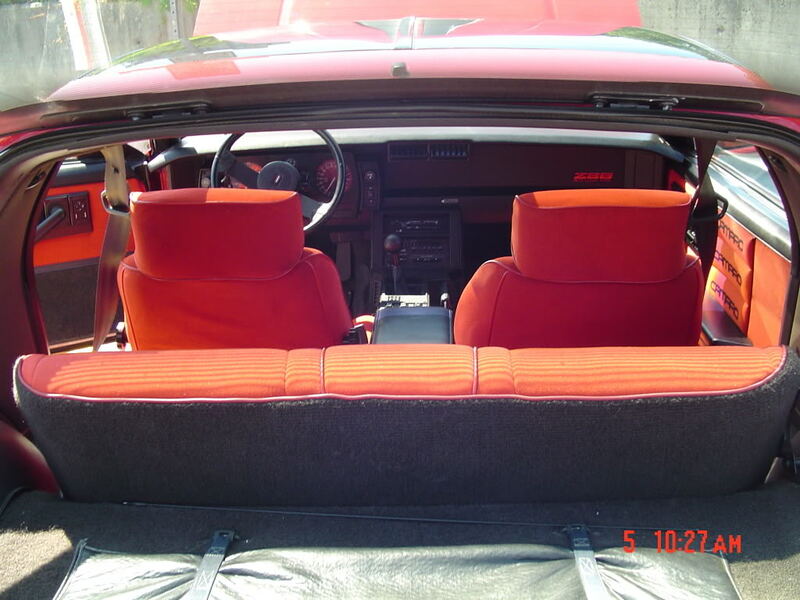 Thats why i hunted around for the fabric and the seats and redid a set to put in my 88 iroc. Yeah Mines just like ur avatar. Yea nice the blue is one of the rarest colors btw. My interior is pictured earlier in the thread. Its the black bolstered with red center conteur interior. I decided i liked two interiors and combined them. i was reading the instruction manual and it said that split folding rear seats is an option, but i dont see it in any sales liturature, is it possible to get the ls interior with split folding rear seats? 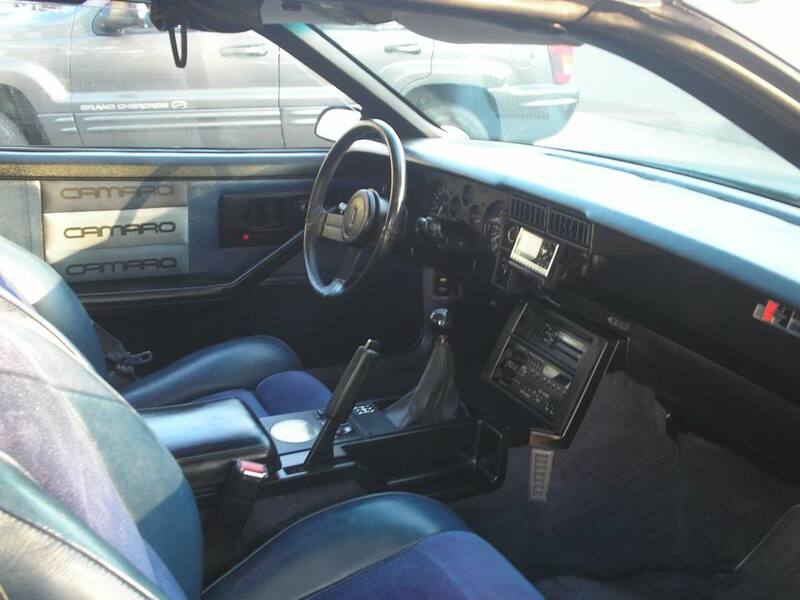 It was possible to get any camaro/firebird interior with the split fold down rear seat option. John in RI has a split fold down rear conteur back that is original so it was possible. 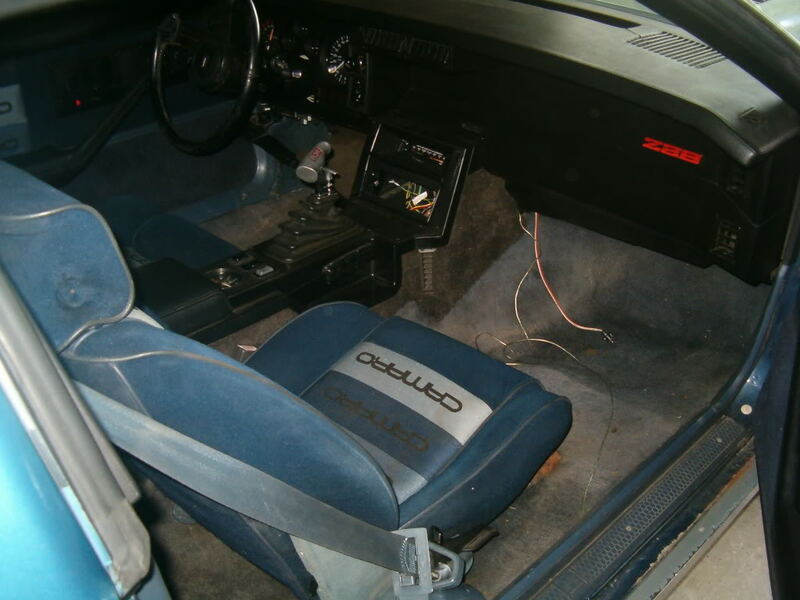 Actually white with a blue conteur interior was one of the combinations that GM allowed. Ive seen one on ebay before and it looked better than one might think. Granted the exterior had blue stripping and emblems but it looked sharp. Oh i know that i was just saying not with my saddle panles and gold iroc wheels and stuff, and i dont think i wanna change allllll my interior. Oh i see what your saying. No that would look terrible. You would need to do everything over to the blue in order for it to look right. Exactly and I just redid all my saddle panels, so its staying. I just keep the 84 with the interior, Its kinda the main reason I bought the car. But I need an engine and trans for it . Hers mine., does need some cleaning. My 85' has the LS interior with the split folding rear seats. Last edited by iroc_zz; 06-19-2009 at 09:19 AM. That bit of information would agree with what i know since John in RI's split rear seat is out of an 85 (black). These interiors really did add up fast which is why you dont really see them with power drivers seat very often. It took me over a month to find the power drivers controls for my seat...since all camaro power motors are the same and i already had a power seat. The controls/housing are basically limited to these seats and possibly early 80s corvettes (have not tested this one yet). The controls/housing are basically limited to these seats and possibly early 80s corvettes (have not tested this one yet). I believe the controls are the same on all thirdgen power seats, but the L/S housing is specific. The 'Vette piece looks identical, IIRC. I thought that too until i had the stock controls from my car next to the LSC controls. Not only is the housing different but the controls are different as well and specific to the LSC housing. I was just going to use my controls in the housing until i found this out. Then i was forced to use the LSC controls. Not to mention i pulled apart both the stock and LSC controls and the LSC ones were made of mostly metal pieces inside where as the standard camaro ones were mostly plastic. I think that can be attributed more to different years than anything else though. The differences between them are minor but enough to that i needed to use the LSC controls or modify the housing extensivly to use the original controls from my camaro. I chose to just use the LSC controls rather than cut up something that is hard to find. A few years have passed since I did the install, so I could easily be wrong (just ask my wife ), but I imagined that I swapped one for the other because of a broken ****. Im still looking for the center **** for mine actually since its just a stick right now. The **** off my other controls is different.